Discussion in 'Star Wars Costumes and Props' started by yodakiller1138, Jun 26, 2006. 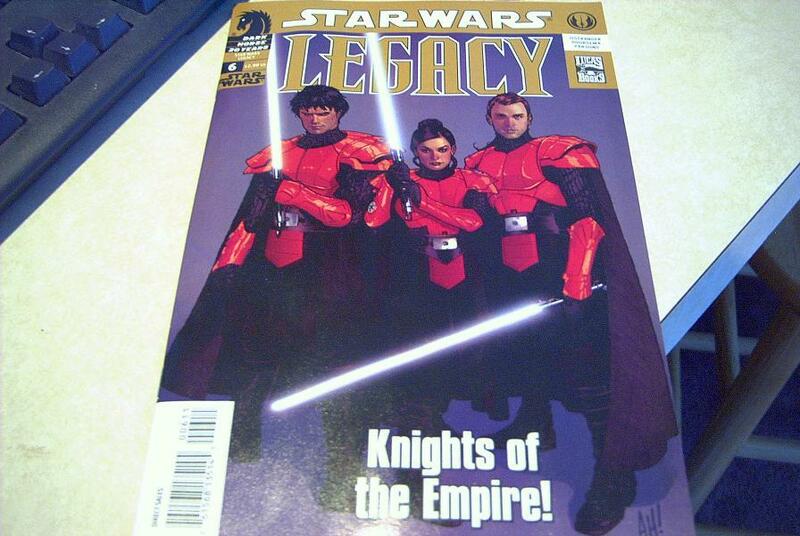 Anybody get the new Star Wars Legacy comic from Dark Horse? There are some incredible designs that would look awesome. Something different from the run of the mill costumes being done. I'm thinking of doing the Imperial Knight costume. I saw some of the designs in the new insider. I like the Imperial Knights and the new Sith. 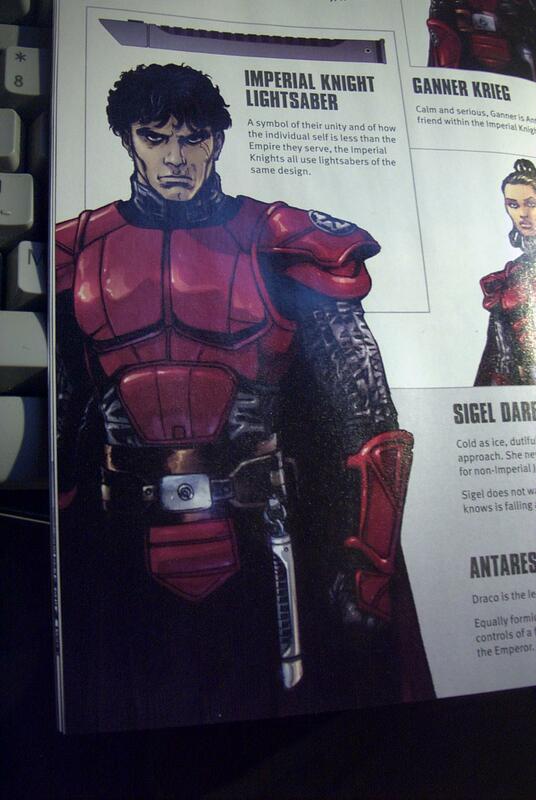 The Knight reminds me a little of the Royal Guard armor in Crimson Empire. knights. I like most of the new stuff..the new TIE's are interesting..
can someone scan the pics in the comics? Check http://www.327thstarcorps.com/ There's talk there about the Imperial Knights, and a pic of the armor. Interesting. That one pic of an Imperial Knight seems to be based off of Vaders Black Body Suit, with the red armor plates over it. Its a good look. In the "Tales of the Jedi" series they would wear armor on occasion. And in the fight between Luke and Darth on Cloud City, Luke's saber deflected of Darth's shoulder armor. Didn't feel too good, but for once he didn't lose a limb. If nothing else, the Imperial Knights certainly look more intimidating than their robed cousins. Are there any interesting new saber designs? Beyond the history, it appears that the Imperial knights have become the new Royal Guards of the Empire. The armor has similarities with RG armor, and they are devoted to the Empire, not the force. The bodyglove was probably a form of general issue, and wasn't it the suit itself that Luke took a chunk out of on Cloud City? Nice suit Can't wait for the next issue. from one of the frames I saw, it looks like the imperial knights have a half-cape hanging from the waist. That, and the vambraces look really cool. I do wish the sabers weren't quite so plain looking. OTOH, a lot of folks should be able to do decent hardware versions. Seems the Imperial Knights wear a jedi/Empire belt buckle. The lightsabers are all the same and simple due to Imperial mindset, AKA all the same and all function. The Imperial Knights all have the same style saber. So it's more of an "issued equipment" idea. Yes, very uniform. But a cool uniform. I'd be interested in doing this one. Really cool... The question is... Would that be the traditional vacu-formed plastic armor that the stars community is so familiar with. Or a molded leather, which would be so much cooler IMO. And someone should get on the tattooed Twi'lek chica. That'd be a topic of much drool at a con. We had a request for that costume. The guy couldn't decide whether he wanted fiberglass or leather. I think either would look cool. Does anyone recognize the gent getting his neck broken by Xizor??? The Graflex Legacy Builds - Office Set Up!